I know, I know. Who cares about a hike in the foothills above Boulder. Well…I do. While not an achievement of note, it is a beautiful way to spend half a day, when no other exercise is available. Brian had a sore back (born of unusual circumstances) and could not carry a pack or even wear a climbing harness, so we decided to do another Boulder 3-Banger hike. It had been almost 6 years since we did our car-shuttle 4-Banger and even longer since our last round-trip 3-Banger. It felt like the right plan. We agreed to start hiking at 6am, and I was only 5 minutes late (which was long enough to miss the bear romping through the park). To spice things up a bit, we decided to head up the 1st Flatiron descent route and then cut over toward the Green Mountain summit. From there, we followed an old trail (along the way I got a cool photo of Brian silhouetted against the dawn sky) to reach the NE Ridge Trail that we followed to find the Greenman trail about 1/2 mile from the summit. By 7:45am, we reached the summit of Green Mountain. It wasn’t a fast time, but we stopped several times to explore. Disappointingly, it was too early for a snack. After gazing longingly at my peanut butter pack, I joined Brian in climbing on rocks and admiring the views, both east and west. I also finished off my 2nd liter of water with the confidence of finding water in Bear Canyon along the way to Bear Peak. 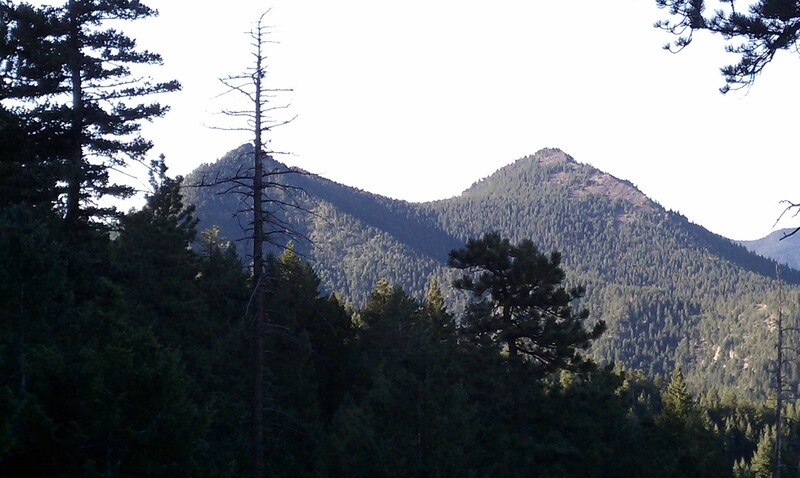 We descended toward Bear Peak, taking the Green-Bear trail. Once we reached the creek that runs down Bear Canyon (oddly named, Bear Canyon Creek), we found a trickling brook just deep enough water to mostly fill our bottles while mostly avoiding visible biological matter. Hiking back up the other side of the valley on Bear Peak’s West Ridge, we began the long trek toward the summit of Bear Peak. We both remembered that it was a long way….and it certainly looked to be a long way off (it was 1.8 miles). regular path, but our path took me on a collision course with zillions of ladybugs. As I scrambled up, I had to crawl beneath a small pine tree to reach a section of rock that I could climb. As I grabbed the tree, I heard a slight tinkling sound, like pine needles falling onto the ground. Once I crawled through the tree, I knew that the sound was not from pine needles. It was ladybugs falling out of the tree. And now 100’s of them were on me. I look off the pack to find a solid layer of ladybugs covering nearly the entire pack. It took a few minutes to shake them off, during which time Brian reminded me that I needed to take off my shirt to remove the rest to avoid crushing several hundred additional bugs. After disrobing and shaking the bugs loose from my shirt, I refused to put that cold, wet t-shirt back on for the remaining 50 feet of scrambling. I wanted the fresh shirt in the pack, but would wait until we reached the summit, which we reached at 9:30am. Dang! It was still too early for a meal, but I could not longer resist. One peanut butter pack, one bar and one liter of water ceased to exist in rapid fashion. Joe finally free of the ladybug embrace (I definitely need to get more sun). We decided to continue to South Boulder Mountain, but refused to descend via Shadow Canyon. 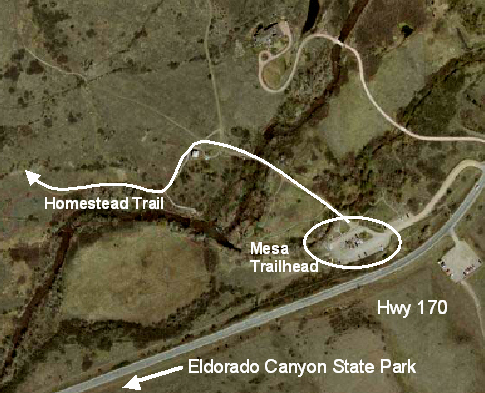 It would add just too many miles of boring hiking along the Mesa Trail. We decided to return to Bear Peak and then descend via Fern Canyon, between Bear and Green. The hike to South Boulder Mountain went quickly (0.7 miles), which was a good thing (as Forrest would say) since the day’s temperature was climbing rapidly. As we stewed in our own juices, we reached the summit amid a forest of raspberry bushes. I thoughtfully called my wife to check in while Brian passed time by gorging on the berries missed by the Bears (who were down in Chautauqua Park looking for yummy trash). It was only 10:30am, so once again we could not eat lunch yet. So back down the trail we went. And, once again I regretted not having sufficient excuse for a peanut butter snack. The hike back was mostly downhill, but it was a lot of downhill. The Fern Canyon trail is quite steep and a steady down, down, down for over 2,500′ feet. I’m sure my quad’s will be angry for a couple of days. I will not even speak of my knees. But, finally, we stopped for lunch at 11:30am when we reached the intersection with the Slab trail. I ate my two remaining peanut butter packs and my 4th liter of water for the day. It was fantastic! We reached Chautauqua Park an hour later, for a 6.5 hour, 10 mile, 4,000′ elevation gain round trip. It was a nice hike (unfortunately, the news of the day was rather shocking). I’ve been playing in the Boulder foothills for as long as I’ve lived my fun city. If fact, my very first “adventure” upon moving to Colorado was to discover a way up the forested hill behind the Flatirons. I drove as close as I could and started hiking with the expectation of bushwacking the entire way. 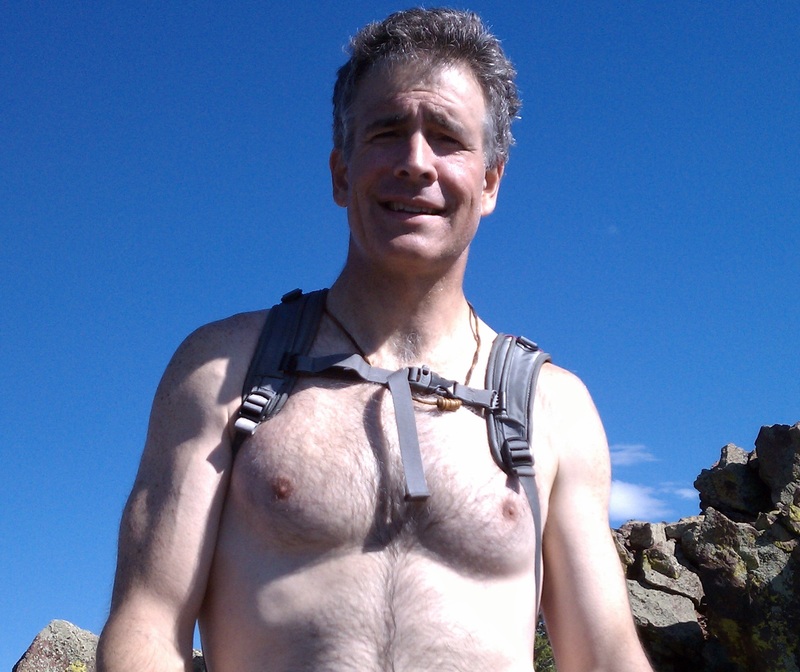 As I discovered that day so many years ago, hiking up Green Mountain is not much of an adventure. There is nothing that can be found that has not been found and forgotten many times over the past 100 years. But I did find a love for that beautiful lump of dirt and trees, and those nearby, that would eventually lead to my Boulder 4 Banger adventure 10 years later. It all started with Green Mountain, which I made time to stand on top of at least 50 times (about 10,000 short of a record) using 10 different paths (most with varations) in the 10 years since moving to Boulder. 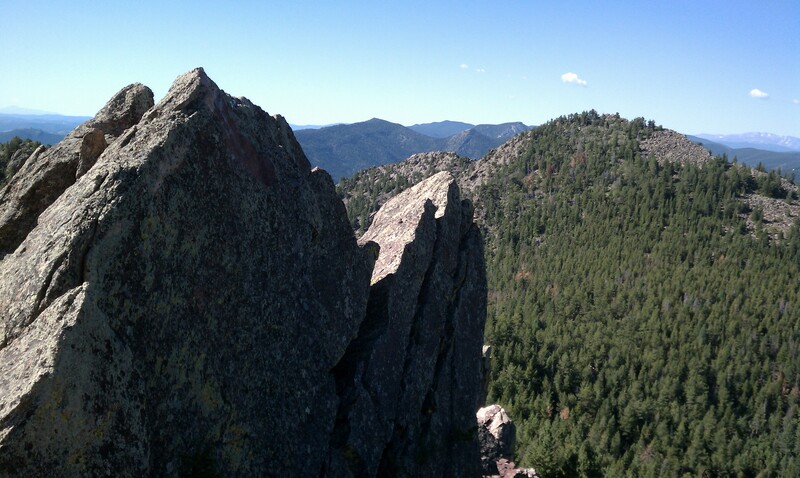 And, I had climbed Bear Peak and South Boulder Peak many times starting from multiple starting points including Eldorado Canyon, Shadow Canyon and Bear Canyon. And, on several occasions over that period of time, I had completed a multiple laps of the Green-Bear combo and the Green-Bear-South Boulder Peak Triple Banger. So, let’s just say I had reason to think I knew the area pretty well. But, as of 11/12/2005, I had never attempted the Flagstaff, Green, Bear, South Boulder combo (the “Boulder 4 Banger”). Heck, I’d never even been to the Flagstaff summit; I suppose it just seemed too easy. The notion of a Boulder 4 Banger percolated in my subconcious until one day my climbing buddy, Brian, and I were looking for something short on a busy weekend. Brian is usually game for something different and he didn’t disappoint. Operation Boulder 4 Banger was a go. 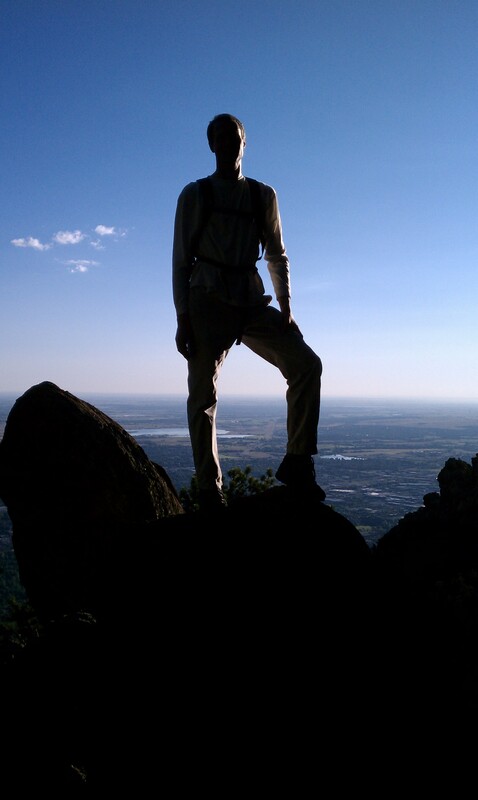 The last time I did the Green/Bear/South Boulder triple it only took 5.5 hours to do the loop by foot. We only had about 5 hours for this effort, so we planned for a car shuttle to allow us to finish hiking before the 4:47pm sunset. And with the Fall weather upon us, we could count on perfect weather for the afternoon. 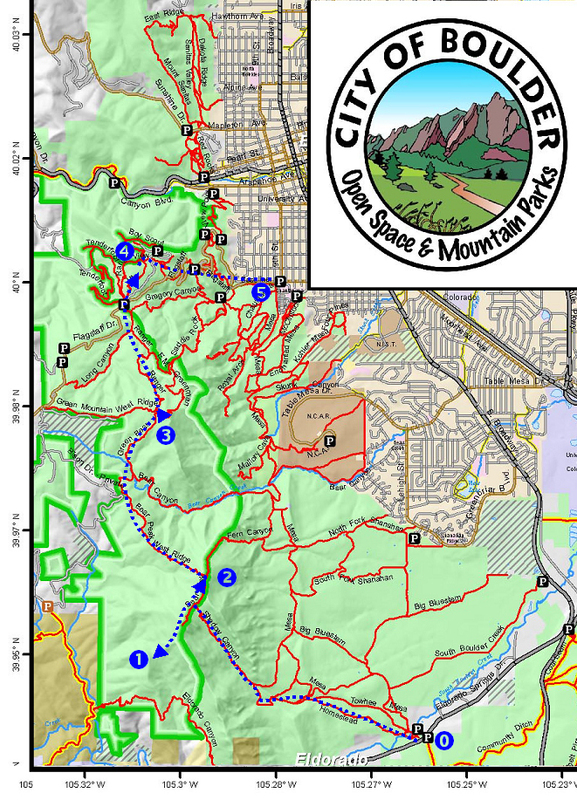 The Plan was to meet at Chautauqua Park in Boulder @ 11:30am, where Brian would leave his truck; then we would drive in my 4Runner to the Mesa trailhead (point 0) near Eldorado Canyon State Park. 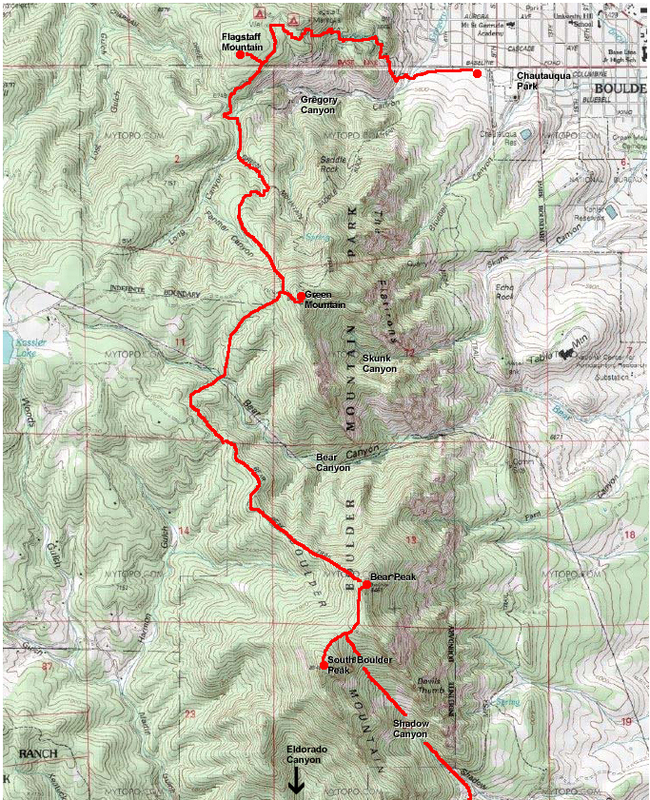 Our route would take the Homestead trail to the Shadow Canyon trail which we’d follow to bag South Boulder Peak (point 1) and then Bear Peak (point 2). From Bear Peak, we’d descend the Bear Peak West Ridge trail toward Bear Canyon and connect with the Green Bear trail. We would then ascend to Green Mountain’s West Ridge, and then turn east to hike to the summit (point 3). 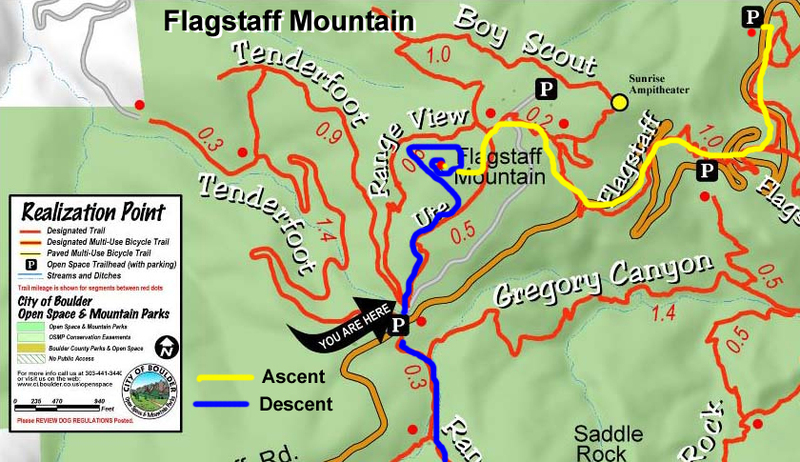 From the summit of Green Mountain, we’d retrace our steps down the West Ridge and then take the Ranger Trail all the way to Flagstaff Road (a bit past the Gregory Canyon turnoff) where we’d connect with the Ute trail on Flagstaff to reach the Flagstaff summit (point 4). And then, finally, we’d follow the signs to Chautauqua Park to reclaim Brian’s truck (point 5). Easy enough. What could go wrong? And it would have worked, too, except for two problems: (1) we didn’t set time-based milestones to track our progress against time or bring a watch to monitor the time; and the early sunset fooled our instincts about remaining daylight and (2) we didn’t aniticipate how inexplicably hard it would be to find the Flatstaff summit. Oh yeah, and we should have brought headlamps. Okay, 3 problems. In the end, our poor planning and insufficient situational awareness would lead to modest suffering, but not to any serious regrets. Late morning on November 12, 2005, I drove to Chautauqua Park and found a common perfect weather weekend, mid-day scene: throngs of people and an ocean of parked vehicles. I had to drive around a bit to find Brian parked further up Baseline Road. He loaded his stuff in the back and jumped in. Alread behind schedule, we drove the 8 miles to Eldorado Canyon as fast as the law allows (right, Officer? ), which is about 25 minutes. We turned off CO-93 onto CO-170 toward Edorado Canyon. A couple miles down the road we turned right into the Mesa Trailhead parking lot. We had to wait a bit to snag a parking spot from someone who had already, responsibly completed the day’s adventure (point zero on map). We started hiking closer to 1pm than seemed reasonable (about 12:35pm) and tried to make up for it with a fast pace. Our route took a quick left just past the Doudy-Debacker-Dunn House to connect to the Homestead Trail. The Towhee Trail would have worked just as well, but we know and like the Homestead better. We hiked by the wide creek for a short distance and then climbed over a sparsley wooded hill. At the bottom of the hill, we stepped over a tiny creek and reconnected with the Towhee trail. We continued past the gingerbread house in a grove of plum trees and headed directly toward and then along the foothills. Along the way we passed beneath The Maiden (the scene of several nice climbing memories) and by the abandoned tin roofed hut before finally reaching the turnoff for Shadow Canyon. Shadow Canyon is arguably the prettiest hike in the area with old growth trees and high rock cliffs and interesting obstacles along the way. We followed this trail underneath and left of additional famous rock climbing, including Jam Crack Spire, The Maiden, The Flying Arch, and The Devil’s Thumb (yes, that thumb-like pinnacle far left of the Flatirons you can see from just about anywhere near Boulder). 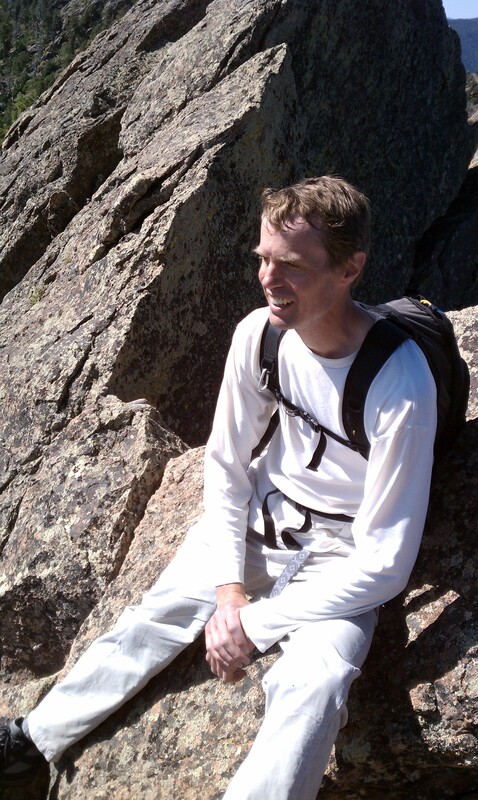 After a bit more than 3 miles and 2700 feet of elevation gain, we reached the top of the canyon and the summit ridge for both South Boulder Peak (SBP) and Bear Canyon. The trail becomes Bear Peak Trail and goes left for SBP or right for Bear Peak. We went left and after 1/3 mile and almost 400 feet of elevation gained reached the SBP summit at approx. 2:15pm (point 1 on map). The views were great and difficult to ignore; we spent a few extra minutes admiring the world before heading off toward Bear Peak just under 1 mile away. As we approached Bear Peak, Brian thought it would be fun to scale the cliff beneath the summit. We poked around looking for a nice chimney and eventually found a 3rd class scramble leading directly to the summit. We arrived on the summit for additional spectacular views at approx. 3pm (point 2 on map). We were vaguely aware that we didn’t have all day to finish, so we left the summit of Bear Mountain nearly as soon as arriving. We crused down the Bear Peak West Ridge Trail to the junction with the Green Bear Trail in Bear Canyon. We then ascended Green Bear to the west ridge of Green Mountain. Then we headed east up the ridge and reached the summit of Green Mountain at approx. 3:45pm (point 3 on map). As always, we enjoyed using the summit marker to identify the many peaks we’ve climbed and those yet to be reached. The Green Mountain summit is a favorite place. But by this time, it started to look like the daylight wouldn’t last forever. We weren’t certain of the time but didn’t want to finish in the dark, so we upped the pace a bit as we retraced our steps down the West Ridge and then down the Ranger Trail to reach the Gregory Canyon trail. Instead of turning east and heading down Gregory Canyon, we continued north up the service road until we reached Flagstaff Road and the Ute Trailhead. We guessed it was about 4:30pm, and that we had about 30 minutes of daylight. Yet, all we had to do was run up the trail to the summit and then descend in a cloud of dust to avoid too much night hiking over loose terrain. So we double-timed it up the Ute trail. But we could see that the trail was not taking us closer to the high point which was off to our left. We kept going and going, hoping that the trail would lead us to the summit. Why wouldn’t the trail go to the summit? 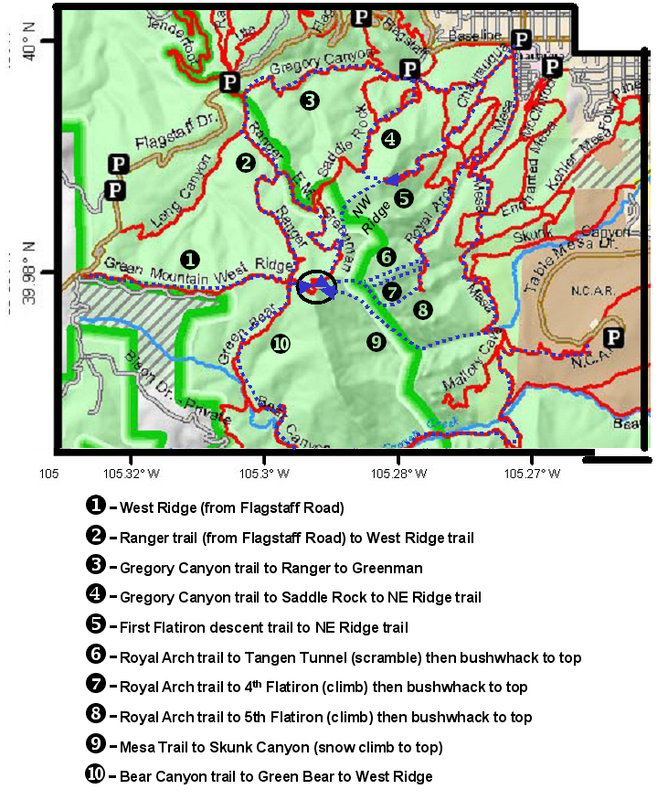 Our wandering route to touch the elusive top of Flagstaff Mountain. Eventually we gave up and backtracked until we were across from the approximate high point, and then we bushwacked across. But the “high point” was elusive. We ended up cutting across to the Range View trail, and then heading back and forth in a spiraling fashion until we found a “high point” that we could live with (point 4 on map). But by that time it was past sunset and into twilight. It was going to be a ankle-twisting, wrong-turning adventure back to Chataqua. Dang. And to make matter worse, we didn’t really know how to get down. The plan was to follow the signs to reach the Flagstaff trail and follow it down to Gregory Canyon or Baseline Road. Now our best chance was to just go downhill while staying on whatever trail we could find. So we headed back to the Ute trail and then started downhill. Of course Brian wouldn’t hear of simply walking down Flagstaff Road. It took about an hour to pick our way down, but we made it with only a few minor injuries (not counting the serious roadrash on my ego). We arrived at Brian’s truck at approx. 6pm (point 5 on map). And after another round of driving, we were finished. All in all, it was a nice afternoon (and a bit) on my favorite mountains in the world.